The rocket recovery team waiting for the helicopter to transport the rocket back to the WSMR launch area. 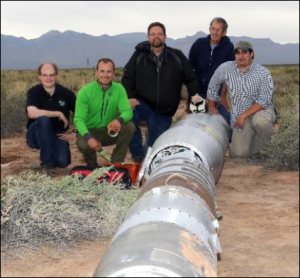 After a one-week delay due to high winds, the latest SDO EVE calibration rocket successfully launched on Wednesday, June 1, from White Sands Missile Range (WSMR) in New Mexico. NASA Rocket 36.318 provided the fifth underflight calibration for solar EUV spectrographs aboard SDO, TIMED, SORCE, SOHO, GOES, PROBA2, and Hinode. SDO EVE instrument was launched into geosynchronous orbit in February 2010. The SDO rocket calibration flights have occurred about once a year for the past five years to accurately determine the long-term variations of the solar extreme ultraviolet irradiance. The June 2016 calibration payload included rocket versions of the SDO EVE and the GOES-R XRS satellite instruments. All of the instruments got excellent measurements and will provide reference spectra for June 1, 2016 when the F10.7 was 88. The payload normally spends about 15 minutes in space with a peak altitude of about 180 miles to obtain the necessary solar EUV spectral irradiance observations. The payload then re-enters and lands via parachute and is recovered for use on future suborbital flights. For NASA Rocket 36.318, LASP and USC provided the science instruments and NASA provides all the other subsystems (launch vehicles, telemetry, attitude control, parachute / recovery, etc.). A video, courtesy of Chris Jeppesen at LASP, shows the forward and aft onboard camera feeds and is posted at https://youtu.be/_IMxYQMaPqg. It shows the forward and aft cameras side-by-side and synced in time for the full flight. Following the recovery, the rocket payload was driven back to LASP for post flight functional tests and a more detailed inspection, as it will be re-used for future flights. PI Tom Woods and the rest of the SDO/EVE team are looking forward to the next rocket flight – planned for June 2018. This figure shows the degradation for AIA and EVE channels for the He II 304 Å emission over the SDO mission. 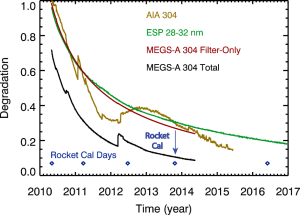 The AIA degradation (gold) is based on transferring the EVE calibration to AIA. The ESP (green) and MEGS-A Filter-Only (red) degradation trends are based on the in-flight daily calibrations with the redundant filters. The MEGS-A total degradation (black) trend includes the filter-only degradation and long-term trending that is only possible with underflight calibration measurements (blue arrow).